Zetsche says the interaction of new trends is "the most exciting and most unknown territory we're embarking on." He is pictured in front of a Mercedes EQ at the Paris auto show. PARIS -- Dieter Zetsche's long and varied career -- he has been CEO of Daimler for more than a decade -- is far from finished. 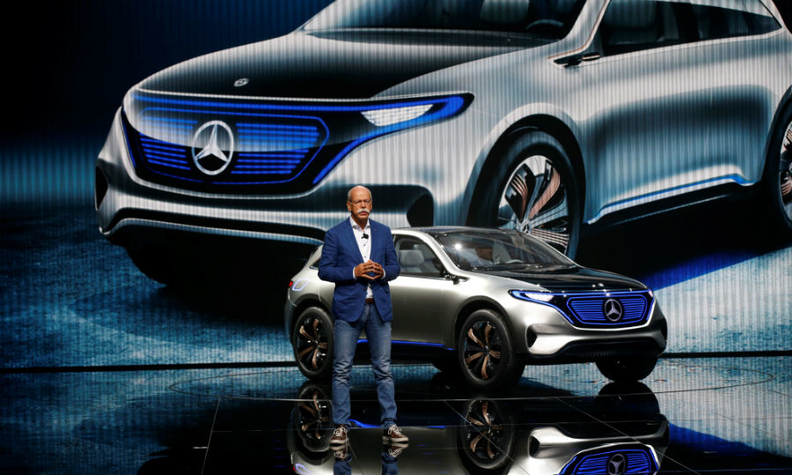 At 63, Zetsche has launched an intense effort to remake Mercedes-Benz -- focusing on the distant future of a company whose founder invented the automobile. In a wide-ranging interview last month at the Paris auto show, Zetsche laid out an ambitious strategy that includes electric vehicles, self-driving and mobility initiatives -- all areas in which he has Mercedes well-positioned. "I'm bullish about these changes ahead of us," he said. Zetsche unveiled in Paris a plan to launch 10 EVs under a new subbrand: EQ. The goal? Make Mercedes the market leader in premium electric cars by 2025. And the EV blitz is just one element of a far-reaching effort to reshape Mercedes. "In all of these fields, you have to invest to be prepared for the future," Zetsche said. "But that's exciting, and that's the world as it presents itself. All of these developments are not happening for technology's sake but because you can offer better and more service to your customers, which ultimately is the basis for the top line and for your future success." Zetsche, whose contract runs through 2019, called the interaction of the new trends "the most exciting and most unknown territory we're embarking on." Integrating the developments into Mercedes' traditional processes will be the task of a newly formed unit dubbed CASE -- an acronym for the connected, autonomous, shared and electric car trends upending the industry. Daimler is known for strict hierarchies, but the CEO has pushed for highly entrepreneurial "swarm organizations" inside Daimler to speed decision-making and empower staff. The idea is to remove layers of bureaucracy and encourage a more experimental approach to new products. "We do believe that building boxes and having lines of reporting and rigid walls of who does what and where is the exact opposite of what we need," Zetsche said. "We want that to evolve. What we have on the paper today or in our heads might be different here a year from now or two. We don't know. We don't know where we're heading, and that's exactly the essence of this kind of new topics we're going to pursue." A few months ago, at a conference in Berlin, Zetsche showed a photo to a group of software developers that he said proved Daimler would lead the digital revolution. The photo depicted a mustachioed Daimler programmer in front of two old tube monitors, according to the German newspaper Handelsblatt. "The point," Zetsche told the developers, amid laughter, "is that this photo was taken 30 years ago," at which time, he said, Daimler was already working on the first self-driving cars. Daimler, Mercedes' parent company, has been among the world's most aggressive automakers in terms of rolling out autonomous vehicles and mobility services such as car-sharing and ride-hailing. The company has launched, acquired or invested in several new mobility firms, including Car2Go and Moovel, an urban trip-planning app. And its aggressive electric-vehicle plans reflect a second wave of EVs aimed at appealing to more than just green-car enthusiasts. In Paris, Zetsche previewed the Generation EQ concept, a near-production small electric crossover boasting roughly 400 hp, more than 300 miles of range and a price tag he says will be close to a "reasonably equipped" Mercedes GLC, or roughly $40,000. The concept accelerates from 0 to 62 mph in under five seconds. It rides on a new, dedicated EV architecture that can underpin SUVs, sedans, coupes and other models with scalable track width and wheelbase. The new EVs will help Mercedes approach what Zetsche describes as the "tipping point" where electric cars will have price, packaging and performance that are competitive with gasoline or diesel cars, whose costs are forecast to rise because of technology needed to meet emissions regulations. Mercedes plans to invest about $1.1 billion in battery production, including $550 million in a second battery plant in Germany, where construction will begin in the near future. And it will continue to assemble battery packs in-house using cells sourced from suppliers. Zetsche said battery economics favor EVs. He said total battery pack costs are falling and will reach around $110 per kilowatt-hour in time for Mercedes' EQ vehicles, compared with costs of more than $330 not long ago. Meanwhile, the company is exploring future battery-cell technology, though it would be premature to bring cell manufacturing in-house, he said. "We're doing pretty serious research for the next cell technology," Zetsche said. "Nobody can tell who out of the 10, 15 labs doing that will ultimately succeed, and this might start a new chapter. At today's technology, it would be not reasonable at all for us as a car manufacturer to invest in our own battery-cell production capacity." Zetsche said offering electric cars that can compete with traditional vehicles powered by internal combustion engines is essential for automakers to meet toughening global regulations. "The only thing which matters is customer demand," he said. "This will enable you to have a second aspect, to fulfill fleet standards as well, but this cannot be the reason why you sell cars. Typically, governments do not mandate customers to buy something."